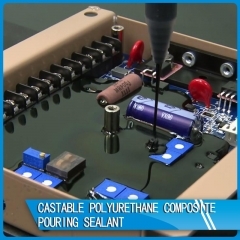 Description Polyurethane prepolymer sealant Key features The cured product has excellent electrical insulation. Anti vibration, moisture, corrosion, etc. Typical properties POURING SEALANT PS-800 Prepolymer Appearance (25℃) Yellow transparent liquid Part A viscosity at Room Temperature (25℃) 1500±100 Part B viscosity at Room Temperature (25℃) 1000±100 Using Mixture Ratio (A：B) 100:100 Available Using Time（25~35℃/min） 20~40 Stripping Time(25~35℃/min) 120~180 Physical Properties of Finished Products Hardness (Shore A) 50±5 Tensile Strength (MPa) 8.0 Tearing Strength (kN/m) 21 Elongation at Break(%) 320 Volume Resistivity(Ω.cm) 1×1014 Application -Suitable for various electronic components, micro computer control board, etc. Usage method -The utility model can be used for manual operation, and is more suitable for gluing machine and pouring machine. Attention The prepolymer should be stored at low temperature and dry place, avoid the moisture and moisture when used After the opening of the prepolymer should be used up as soon as possible, if not exhausted with nitrogen seal. The storage period of unopened prepolymer is three months. If you want to add color paste or other materials, keep the water content below 0.1%, and consider the compatibility of additives. Description Encapsulation Composite Material Key features Fast curing speed, suitable for casting machine operation. Low molding temperature, high production efficiency. High tensile and tear properties. Can produce high light, Matt products. 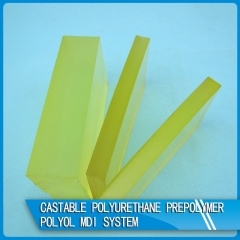 Typical properties Encapsulation Composite Material ECM-301 HZ-302 HZ-303 Prepolymer Part A Appearance (25℃) Yellow Transparent Liquid Yellow Transparent Liquid Yellow Transparent Liquid Part B Appearance (25℃) Colorless Transparent Liquid Colorless Transparent Liquid Colorless Transparent Liquid Part A Viscosity at Room Temperature (25℃) 1000±200 1500±200 1500±200 Part B Viscosity at Room Temperature (25℃) 800±200 2000±200 1500±200 Using Mixture Ratio (A：B) 100:100 100:100 100:100 Available Using Time（70-75℃/min） 5~8 3~5 3~5 Stripping Time (90~100℃/min) 40~50 25~35 25~35 Physical Properties Hardness (Shore A) 80±5 85±5 90±5 Tensile Strength (MPa) 15.8 27.8 30.6 Tearing Strength (kN/m) 44.2 61.0 67.3 Elongation at Break (%) 667 521 510 Application -Mainly used in the production of large quantities of polyurethane elastomer products, such as a variety of rollers, skateboard wheels, fitness equipment, rubber, industrial parts, etc. Usage method -The utility model is mainly suitable for the operation of the middle and low temperature pouring machine, and can be operated manually by adjusting. The use of two components, the ratio of 100:100 or 100:50~100. 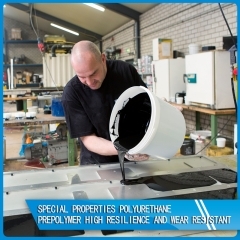 Attention The prepolymer should be stored at low temperature and dry place, avoid the moisture and moisture when used. After the opening of the prepolymer should be used up as soon as possible, if not exhausted with nitrogen seal. The storage period of unopened prepolymer is three months. If you want to add color paste or other materials, keep the water content below 0.1%, and consider the compatibility of additives. 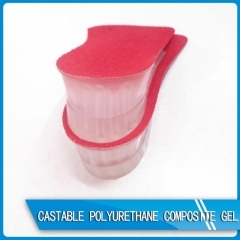 Description Polyurethane prepolymer GEL Key features Environmentally friendly non-toxic, tasteless, colorless and transparent. With a good rebound and feel. Typical properties GEL GEL-401 HZ-402 HZ-403 Prepolymer Appearance (25℃) Colorless Transparent Liquid Colorless Transparent Liquid Colorless Transparent Liquid Part A viscosity at Room Temperature (25℃) 500±100 500±100 500±100 Part B viscosity at Room Temperature (25℃) 1000±100 1000±100 1000±100 Using Mixture Ratio (A：B) 100:20~25 100:20~25 100:25 Available Using Ttime（25~35℃/min） 1~3 1~3 1~3 Stripping Time (90~100℃/min) 3~5 3~5 3~5 Physical Properties Hardness (Shore A) 0 0~5 0~25 Application -Mainly used in the production of various medical mats, mattresses, pillows, insoles, protective coating, etc. Usage method -The utility model can be used for manual operation. Attention The prepolymer should be stored at low temperature and dry place, avoid the moisture and moisture when used After the opening of the prepolymer should be used up as soon as possible, if not exhausted with nitrogen seal. The storage period of unopened prepolymer is three months. If you want to add color paste or other materials, keep the water content below 0.1%, and consider the compatibility of additives. 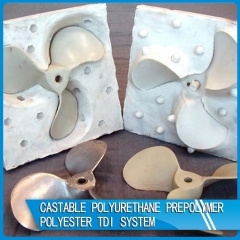 Description Polyurethane prepolymer polyester TDI system Key features General purpose products, the most widely used. High mechanical strength, good wear resistance. Good oil resistance, solvent resistance, heat resistance. Typical properties Plyester tdi system Pes-610 Pes-611 Pes-612 Pes-613 Pes-614 Pes-615 Prepolymer Appearance (25℃) Waxy solid Waxy solid Waxy solid Waxy solid Waxy solid Waxy solid Nco content(%) 2.4~2.6 3.0~3.5 3.6~4.2 4.0~4.5 4.5~4.8 5.0~5.8 Using mixture ratio (phr) 6.9~7.5 8.6~9.5 9.0~10.0 11.0~12.0 13.5~14.5 15.0~16.0 Life in the reaction kettle(75-78℃/min) 5~7 5~7 5~7 5~7 3~5 3~5 Physical properties of finished products Hardness (shore a) 60±5 75±2 80±2 85±2 90±2 95±2 Tensile strength (mpa) 28.7 33.5 42.3 45.5 48.8 52.6 Tearing strength (kn/m) 35.9 49 52 55.1 58.3 60 Elongation at break(%) 498 474 451 440 410 337 Akron abrasion(cm3/1.61km) 0.05 0.03 0.03 0.02 0.02 0.02 Application Mainly used in the production of ordinary polyurethane elastomer products, such as a variety of industrial components, roller, rubber roller, rubber, oil seal, cushioning materials, plates, etc. Usage method Suitable for manual and high temperature casting machine operation, chain extender is MOCA. Attention The prepolymer should be stored at low temperature and dry place, avoid the moisture and moisture when used After the opening of the prepolymer should be used up as soon as possible, if not exhausted with nitrogen seal. The storage period of unopened prepolymer is three months. If you want to add color paste or other materials, keep the water content below 0.1%, and consider the compatibility of additives. 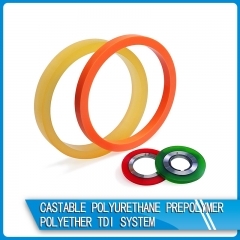 Description Polyether prepolymer polyether TDI system Key features General purpose products. High mechanical strength Good abrasion resistance, good hydrolysis resistance Easy to operate, low price. 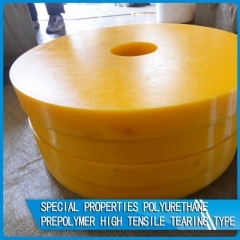 Typical properties Polyether TDI System PET- 510 PET- 511 PET- 512 PET- 513 PET- 514 PET- 515 Prepolymer Appearance (25℃) viscous liquid viscous liquid viscous liquid viscous liquid viscous liquid viscous liquid NCO Content(%) 2.8~3.0 3.6~4.0 4.2~4.5 4.8~5.5 5.5~6.0 6.0~6.8 Using Mixture Ratio(PHR) 8.0~8.5 10.0~11.5 12.0~13.0 13.5~15.8 15.5~16.0 16.0~18.8 Life in the Reaction Kettle(75-78℃/min) 8~10 5~7 5~7 3~5 3~5 3~5 Physical properties of finished products Hardness (Shore A) 60±5 75±2 80±2 85±2 90±2 95±2 Tensile Strength (MPa) 20.7 22.5 22.8 26.1 32.6 35.6 Tearing Strength (kN/m) 22.6 27.2 27.5 33.4 38.2 38.2 Elongation at Break(%) 401 377 358 350 320 313 Akron Abrasion(cm3/1.61km) 0.05 0.05 0.05 0.05 0.03 0.03 Application -Mainly used in the production of ordinary polyurethane elastomer products, such as a variety of industrial components, roller, rubber roller, rubber, oil seal, cushioning materials, plates, etc.. Usage method Suitable for manual and high temperature casting machine operation, chain extender is MOCA. Attention The prepolymer should be stored at low temperature and dry place, avoid the moisture and moisture when used After the opening of the prepolymer should be used up as soon as possible, if not exhausted with nitrogen seal. The storage period of unopened prepolymer is three months. If you want to add color paste or other materials, keep the water content below 0.1%, and consider the compatibility of additives. 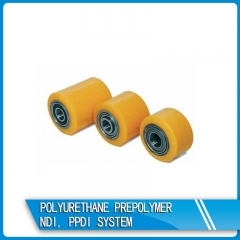 Description Polyurethane prepolymer polyol MDI system Key features No irritating odor. Products have good toughness and elasticity. Excellent abrasion resistance and water resistance. Typical properties polyol MDI system P-MDI--100 P-MDI -101 P-MDI -102 P-MDI -103 P-MDI -104 P-MDI -105 Prepolymer Appearance (25℃) Waxy solid Waxy solid Waxy solid Waxy solid Waxy solid Waxy solid NCO Content(%) 5.5~6.5 6.6~7.2 7.5~8.5 5.0~6.0 6.0~6.8 7.2~8.0 Using Mixture Ratio (PHR) 5.6~6.6 6.7~7.3 7.6~8.6 5.1~6.1 6.1~6.9 7.3~8.1 Life in the Reaction Kettle (75~78℃/min) 8~10 5~7 5~7 8~10 5~7 5~7 Physical properties of finished products Hardness (Shore A) 60±5 85±5 95±5 60±5 85±5 95±5 Tensile Strength (MPa) 51.3 55.3 57.2 41.7 45.5 52.8 Tearing Strength (kN/m) 78.4 135.0 135.7 70.6 123.2 127.5 Elongation at Break (%) 516 520 498 461 577 558 Akron Abrasion (cm3/1.61km) 0.08 0.05 0.03 0.08 0.05 0.03 Application Mainly used in the production of polyurethane elastomer products with the corresponding requirements, such as a variety of industrial components, roller, rubber roller, rubber, oil seal, cushion material, plate, etc.. Usage method Can be used for manual operation, more suitable for the operation of the casting machine, chain extender are BDO and TMP, etc. Attention The prepolymer should be stored at low temperature and dry place, avoid the moisture and moisture when used After the opening of the prepolymer should be used up as soon as possible, if not exhausted with nitrogen seal. The storage period of unopened prepolymer is three months. If you want to add color paste or other materials, keep the water content below 0.1%, and consider the compatibility of additives. Description Polyurethane prepolymer NDI, PPDI system Key features The utility model has the advantages of high dynamic mechanical property, especially heat resistance, and can work in the environment of 120 DEG C for a long time. Typical properties NDI、PPDI system NP-240 NP-245 Prepolymer Appearance (25℃) Waxy solid Waxy solid NCO Content (%) 3.6~4.2 3.6~4.2 Using Mixture Ratio (PHR) 3.7~4.3 3.7~4.3 Life in the Reaction Kettle 3~5 3~5 Physical Properties of Finished Products Hardness (Shore A) 90±5 90±5 Tensile Strength (MPa) 53.5 57.1 Tearing Strength (kN/m) 129.5 131.7 Elongation at Break (%) 523 551 Akron Abrasion (cm3/1.61km) 0.01 0.01 Application -The utility model is mainly used for producing products with the characteristics of heat resistance, high abrasion resistance, high bearing capacity, low internal heat generation, etc. Usage method -Can be used for manual operation, more suitable for the operation of the casting machine, chain extender is BDO or HQEE, etc. Attention The prepolymer should be stored at low temperature and dry place, avoid the moisture and moisture when used After the opening of the prepolymer should be used up as soon as possible, if not exhausted with nitrogen seal. The storage period of unopened prepolymer is three months. If you want to add color paste or other materials, keep the water content below 0.1%, and consider the compatibility of additives. 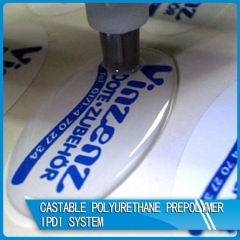 Description Polyurethane prepolymer IPDI system Key features Good transparency Excellent UV resistance Low viscosity at room temperature With adjustable curing time. Typical properties IPDIsystem IPDI-230 IPDI-231 IPDI-232 Prepolymer Appearance (25℃) Colorless Transparent Liquid Colorless Transparent Liquid Colorless Transparent Liquid NCO Content(%) 400±100 400±100 400±100 Using Mixture Ratio (PHR) 100:100 100:100 100:100 Life in the Reaction Kettle 180~480 180~480 180~480 Stripping Time（90-100℃/min） 3~5 3~5 3~5 Physical Properties of Finished Products Hardness (Shore A) 65±5 85±5 70±5D Tensile Strength (MPa) 15.2 17.0 22.3 Tearing Strength (kN/m) 10 19 25 Elongation at Break(%) 170 130 110 Application -The utility model is mainly used for the production of products which are not required to be changed, such as a lens, an instrument panel, and can also be used for dripping glue, making nameplate, labels, etc. Usage method -The utility model can be used for manual operation, and is more suitable for gluing machine and pouring machine. Attention The prepolymer should be stored at low temperature and dry place, avoid the moisture and moisture when used After the opening of the prepolymer should be used up as soon as possible, if not exhausted with nitrogen seal. The storage period of unopened prepolymer is three months. If you want to add color paste or other materials, keep the water content below 0.1%, and consider the compatibility of additives. The prepolymer should be stored at low temperature and dry place, not long time at higher temperatures (more than 75 degrees Celsius) heating. 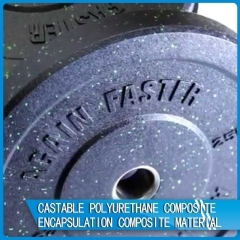 SA-235 is a primer specially designed for PET films. It can improve the adhesive force between glue with PET. 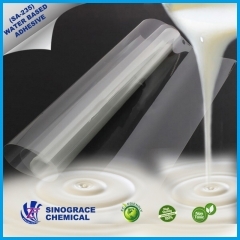 Improve the glue coating property on PET film with excellent water resistant. 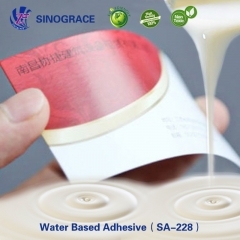 Water based laminating adhesive for paper and BOPP. It adapts to dry lamination quick drying (tunnel drying). Eco-friendly, non-toxic and excellent comprehensive performance. It can replace solvent based laminating adhesive.